Single domain protein. Impressive NMR structure with all residues modeled well. 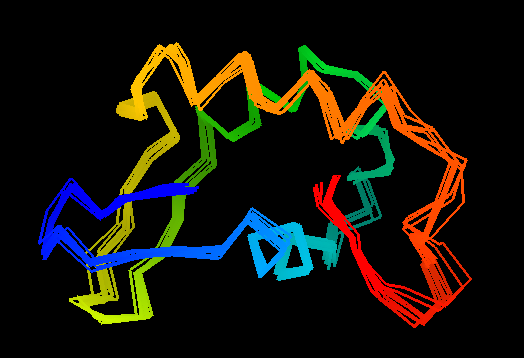 Rubredoxin-like zinc-ribbon elaborated by the insertion of 3 α-helices (blue-cyan-green) between the two zinc-knuckles and a C-terminal α-helix (orange) followed by a β-hairpin (red). Zinc ion is shown in magenta and side chains of its ligands (four Cys) are displayed. Fold recognition. This protein is a "hybrid" of fold recongnition and de-novo modeling. The zinc-ribbon is possible to detect, although care needs to be taken to distinguish it from spurious HHsearch hits to C2H2 zinc-fingers. However, no homologus template existis to model α-helical insertion and C-terminal extension, which are quite long and essential to produce a good model. The first residue is Met in the target, but Ser in PDB. 20 C-terminal residues of the target 89-LNDLLALETMLEEWDRRVKR-108 are not present in NMR structure. PDN numbering starts from 8, so residue 1 in the target corresponds to residue 8 in PDB. First models for T0476: Gaussian kernel density estimation for GDT-TS scores of the first server models, plotted at various bandwidths (=standard deviations). The GDT-TS scores are shown as a spectrum along the horizontal axis: each bar represents first server model. The bars are colored green, gray and black for top 10, bottom 25% and the rest of servers. The family of curves with varying bandwidth is shown. Bandwidth varies from 0.3 to 8.2 GDT-TS % units with a step of 0.1, which corresponds to the color ramp from magenta through blue to cyan. Thicker curves: red, yellow-framed brown and black, correspond to bandwidths 1, 2 and 4 respectively.